RESEARCH TRIANGLE PARK, NC--(Marketwired - February 14, 2017) - Although adaptive design clinical trials are a trending practice for developing new drugs, pharmaceutical companies still pursue plenty of non-adaptive trials. 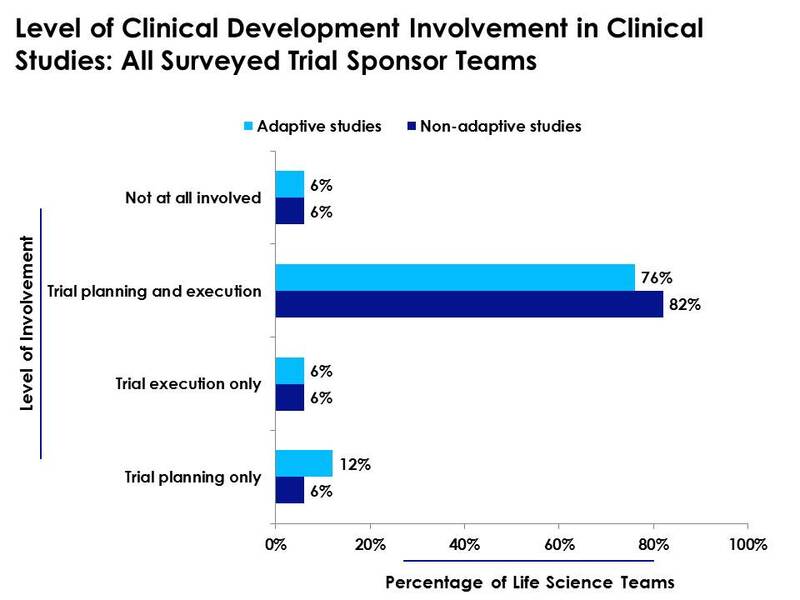 In fact, 76% of clinical development teams at surveyed drug manufacturers in a recent study plan and execute adaptive studies, while a higher percentage of these teams -- 82% -- plan and execute traditional, non-adaptive clinical trials. Cutting Edge Information's study, Adaptive Design Clinical Trials: Strategically Modify Traditional Methodologies to Support Efficient Clinical Operations, found that the broader clinical operations groups were not as likely to be involved with trial planning and execution compared to clinical development teams. 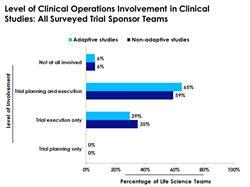 In fact, only 65% of surveyed companies reported that their pharmaceutical clinical operations groups plan or execute adaptive studies. 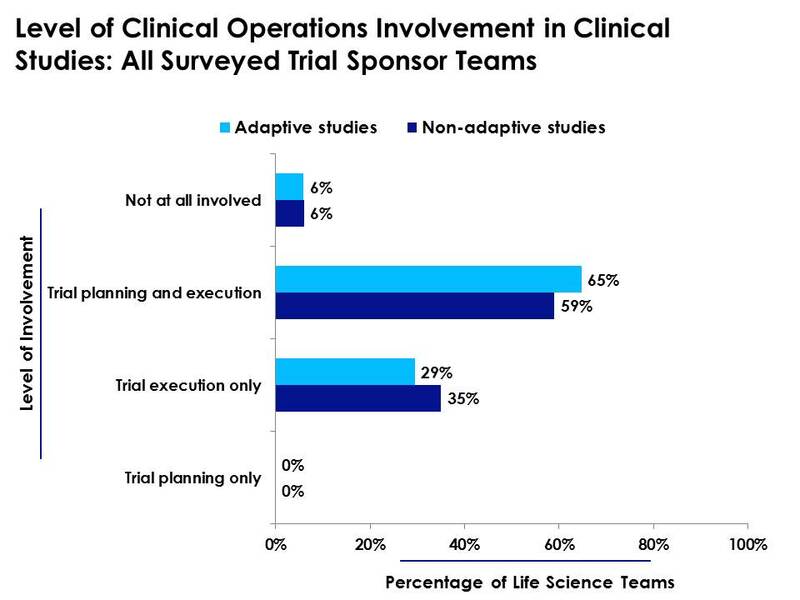 Unlike clinical development teams, however, the data show that only 59% of surveyed drug manufacturers reported that their clinical operations teams impact trial planning and execution for non-adaptive studies. "Often, companies involve similar groups in both adaptive and non-adaptive studies but leverage individual expertise in different ways," said Sarah Ray, senior research analyst at Cutting Edge Information. "However, the contributions of different subteams do not change dramatically from non-adaptive to adaptive studies." Interviewed executives observe that clinical staff at all companies may have varying levels of familiarity with adaptive trial methodologies. However, their ability to use that knowledge depends on the degree to which organizations support their adaptive trials. Adaptive Design Clinical Trials: Strategically Modify Traditional Methodologies to Support Efficient Clinical Operations, available at https://www.cuttingedgeinfo.com/product/adaptive-design-clinical-trials/, details the time- and cost-savings metrics associated with adaptive design clinical trials. 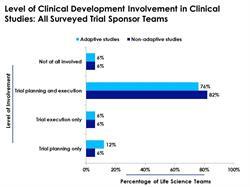 This report covers the industry's use of adaptive trial design including organizational structures, resources and uses of adaptive designs across specific trial development stages and therapeutic areas. Cost-per-patient benchmarks for early- and late-stage adaptive and non-adaptive trials. Metrics tracking cross-functional involvement in adaptive trial design. Ratios of adaptive vs. non-adaptive clinical studies across 11 therapeutic areas. Real-world profiles illustrating how life sciences teams are using adaptive design. Analysis of adaptive trial design planning and execution challenges and solutions. To see a list of Cutting Edge Information's clinical development industry research studies, please visit https://www.cuttingedgeinfo.com/product-category/clinical-development/.